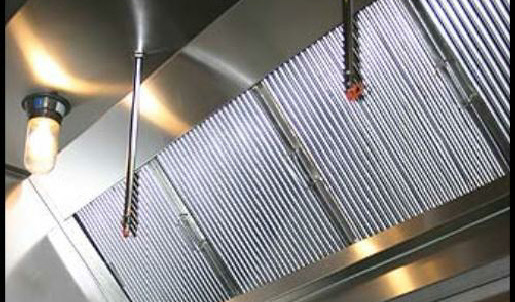 Although it may seem simpler to hire a professional to clean your food truck exhaust hood, there are a number of advantages to conducting the clean up yourself. 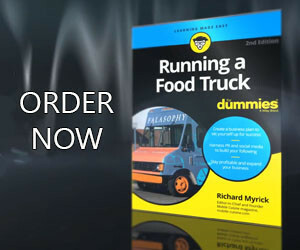 Number one is what most food truck vendors are looking at…cost savings. Cleaning your food truck exhaust hood and filters yourself can save your mobile food business hundreds of dollars every year. In addition to this savings, learning how to do-it-yourself can allow you to clean the hoods, filters and any duct work more frequently. The result will be a cleaner food truck kitchen and a decreased chance of fires breaking out from built-up grease and food debris. Turn off the pilot lights on the ovens, range tops and fryers within the food truck. Allow all the exhaust pans and filters within the hood to cool until they can be handled comfortably. Turn off the exhaust hood’s power, and make sure the system’s power is also disconnected. Cover all surfaces near the cleaning area with plastic sheeting. Fill a large tub with hot water, and add in liquid degreaser, (follow ratios recommended on the container). Put on your eye protection. Remove all of the grease pans and exhaust filters. Pour off excess grease into a waste grease container. Wipe the excess grease and debris out of each filter, and pan with clean paper towels. Coat all sides of each piece with spray degreaser, and use your cleaning brush to gently scrub and loosen debris. Immerse each filter and pan in the hot water tub after scrubbing (you may need to do this in your commercial kitchen space if your truck’s sinks are too small). Let the pieces soak thoroughly until the exhaust hood has been cleaned and dried. Remove each pan and filter from the soaking water, and rinse with a strong stream of hot water. Make certain each piece is clean. Dry completely with clean, towels. Replace within the cleaned exhaust hood. Use a clean scrub pad soaked with hot water and a mild liquid detergent to scrub the interior and exterior of the exhaust hood. Use the scrub pad to gently scrub grease and debris from the piping located within the hood. Dampen a towel with hot water, and wipe off all soapy residue from all parts of the hood and piping. Spray each part with spray degreaser, wipe off with another warm, damp towel, and dry completely with a clean towel. Dry thoroughly to prevent rust from forming. Please Note: In some municipalities, when you get inspected, inspectors want to see a certified receipt by a professional commercial pressure washing kitchen specialist or they will not sign off your inspection. Check with your local inspectors to find out what they are looking for. We hope this guide helps you save some of your hard earned vending profits and also provides a clean food truck hood system that won’t erupt in flames.